A moderate solar flare early this week has generated charged particles that will light up the atmosphere — and could impact power grids and satellites — as early as Thursday. If you live in the high latitudes, expect to see the Northern or Southern Lights shortly. A solar storm is on its way to Earth, as charged particles from the sun move towards our planet. The solar particles are expected to hit as early as Thursday, February 15, but could arrive the following day. Auroras will shine in the sky as the charged particles hit gas molecules high in the atmosphere, causing molecules to glow. There's also a small chance that the storm will disrupt satellites or power grids. "Aurora may be visible at high latitudes," the National Oceanic and Atmospheric Administration wrote in a statment. This could include the "northern tier" of the United States, with affected states including northern Michigan and Maine. NOAA added that the forecast calls for a high probability of a G-1 or "minor" storm, which could strengthen to a G-2 or "moderate" storm depending on how the stream of particles hit Earth. Geomagnetic storms are ranked on a scale, with G at the bottom, R in the middle, and S as the most severe. Forecasts now say the particles will give our planet a glancing blow. The particles, which originated from the sun after a moderate solar flare on February 12, could also affect power grids or spacecraft. NOAA stated that "weak power grid fluctuations" are possible, as well as a "minor impact on satellite operations." NOAA and NASA monitor the sun using several telescopes; famous examples are the Solar Dynamics Observatory (SDO) and the Solar and Heliospheric Observatory (SOHO). These telescopes help generate weather forecasts by detecting when solar activity occurs. Scientists also study the sun to learn more about its internal structure and gather data to make better predictions about flares and particle ejections. Solar flares and particle ejections are associated with sunspots — dark areas on the sun's surface — that host intense magnetic activity. As the magnetic fields in a sunspot cross, NASA stated, this can cause a sudden energy explosion, also known as a solar flare. This sends radiation out into space. 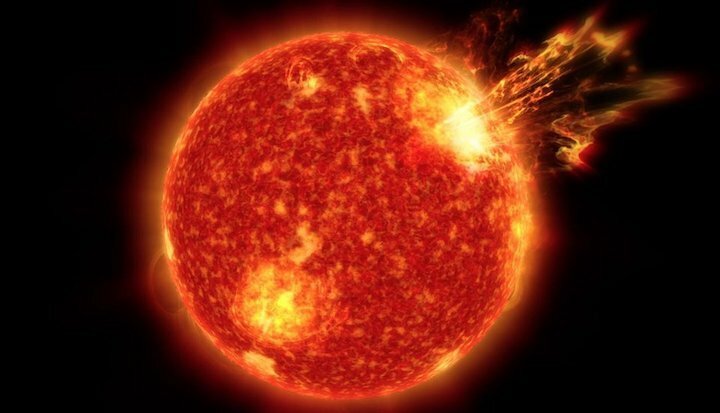 Sometimes these explosions can also send off charged particles, which are called coronal mass ejections or CMEs. "CMEs are huge bubbles of radiation and particles from the sun," NASA stated. "They explode into space at very high speed when the sun's magnetic field lines suddenly organize." Many solar flares and CMEs blast harmlessly off into empty space. If they are directed towards Earth, however, space forecasters keep a close eye to see how severe the solar storm will be. If the storm looks bad, engineers can shut down non-essential systems on satellites or prepare for possible fluctuations in the power grid. The sun has an 11-year cycle of sunspot activity. The last maximum in the cycle was in April 2014, with frequent and powerful solar flares and CMEs. The year 2018, by contrast, is expected to be quieter. This summer, NASA will launch a car-sized spacecraft called the Parker Solar Probe, which will venture closer to the sun than any other mission dedicated to observing it. After flying by Venus a few times, the probe will sail into the corona — the sun's tenuous upper atmosphere. Parker will make its closest approach at four million miles, which is nearly 15 times closer to the sun than the planet Mercury. Its goal is to learn more about the stream of particles emanating from our sun.